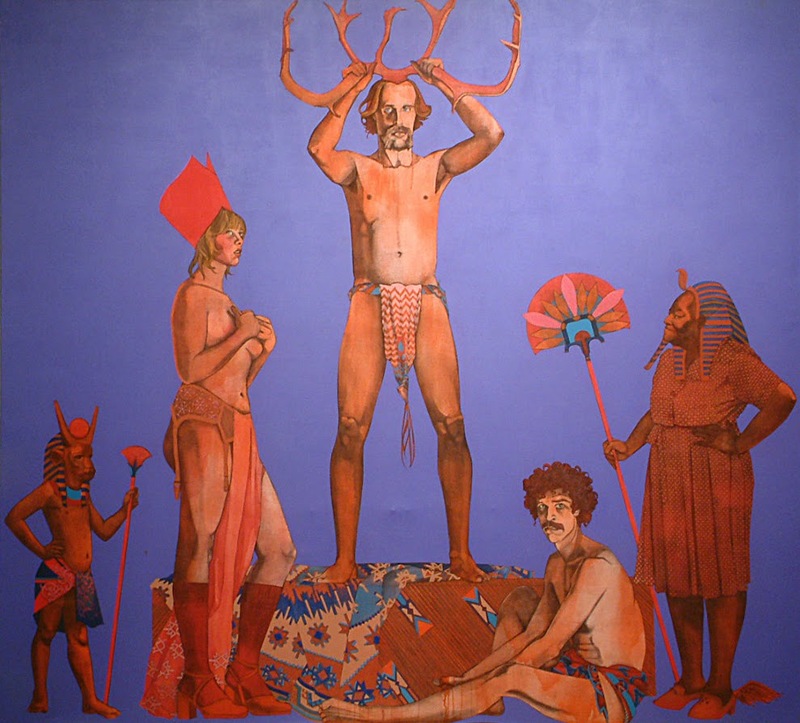 Potiphar Cornuto, c. 1978, acrylic on canvas, 114x126"
David Lusk Gallery Memphis hosts a discussion led by Robbie McQuiston and the Rev. Mimsy Jones of the current exhibition Mary Sims: Zuma and the Bible, Thursday, March 12, at 6pm. The exhibition is comprised of four monumental Biblical story paintings. The discussion will include snacks and drinks and an insightful dialogue of both Blical and art historical significance. Sims was intrigued by the Bible stories told to her by Zuma, her parents’ housekeeper. Zuma told stories where the primary character was always the woman. At a mid-point of her career, Sims decided to paint those stories. She auditioned friends to be in the paintings, cast and costumed them, then photographed the figures and setting in great detail. Some of these characters are Memphis folks; Zuma is in two of the paintings. Robbie McQuiston has a Master’s in Art History with an emphasis in Modern Art and has taught Introduction to Art at The University of Memphis. She was an Associate in Adult Formation for Church of the Holy Communion and the Diocese of West Tennessee for many years. The Rev. Mimsy Jones is a deacon in the Episcopal Diocese of West Tennessee. She is a frequent Bible study leader for churches and groups throughout West Tennessee. Jones makes a cameo appearance in a late Mary Sims portrait of her husband Frank Jones. David Lusk Gallery Memphis is located in Laurelwood between Perkins Extended and Grove Park. Gallery hours are Tu-Fr 10-5:30 and Sa 11-4. For information or visuals, contact Brittney shedden at 901-767-3800 or brittney@davidluskgallery.com.